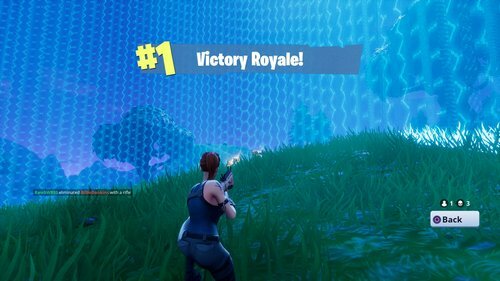 Home » Games » Fortnite Battle Royale Tips for Beginners: You Are Now Prepared! The battle royale genre is taking the world by storm this year, especially with Fortnite Battle Royale HD. Many, many people have taken interest in joining the fray. However, this battle royale game is quite unique compared to many other FPS games or battle royale games like PUBG. So if you are not prepared, then it is time to slow down a little bit and ready for the future battles ahead! And with no further ado, here’s are Fortnite Battle Royale tips and tricks! 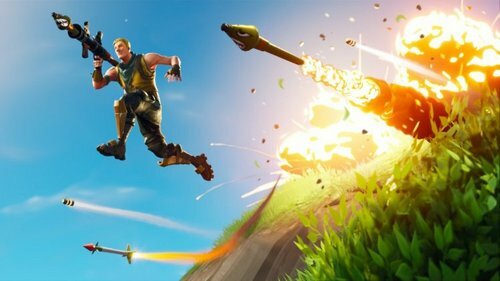 Fortnite Battle Royale is currently among the most popular games to date with over 3 million concurrent players. The game is so extremely popular that Epic Games even claimed that they will provide $100,000,000 to fund prize pools for Fortnite competitions. Crazy isn’t it? Such huge popularity also means many new players will come. But unlike other standard FPS games, there are several elements which we need care about if we want to ensure higher winning chance. In short, 100 players will be thrown into an isolated island where those players have to survive until one last man (or team) standing. The map is rather big and it is filled with tons of locales where players can search for supplies, materials, and on top of that: weapons. As the game progresses, the map will be tightened closer and closer to the center. Therefore, there are several gameplay elements we will need to know to survive in this harsh battlefield since death can come from every corner. 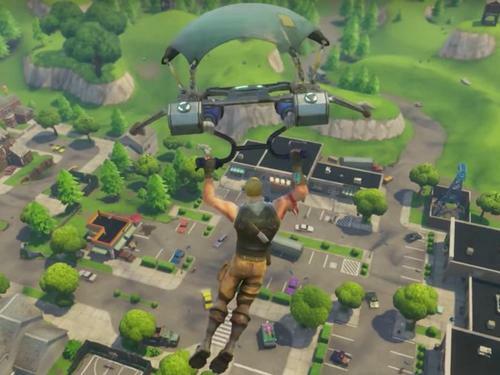 At the moment Fortnite Battle Royale only features a single map which is an isolated island filled with tons of buildings and locations. At the start of the game, players will be transported to this map via a… bus strapped with a balloon. Players can get to choose when they need to jump down, where they want to go and use parachute to land there safely. 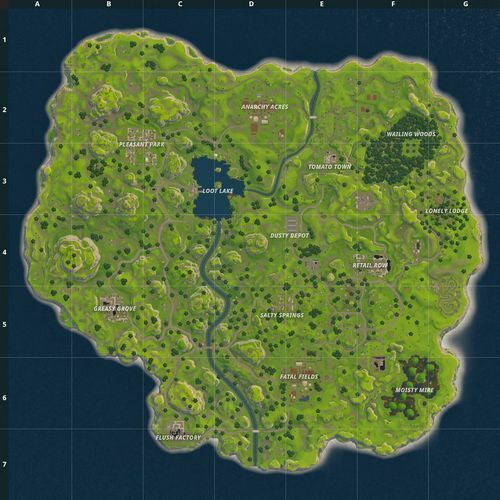 Comparing to PUBG’s map, Fortnite’s has smaller playing area. Luckily, there are lots of places and buildings to explore. Smaller area means fighting will occur more often than PUBG but luckily, buildings tend to have loots and supplies so we will not have to worry much about weapons and ammos. Similar to PUBG’s map though, as the game progresses, players will see an alert warning that the storm is coming. Basically it means the map is closing in. 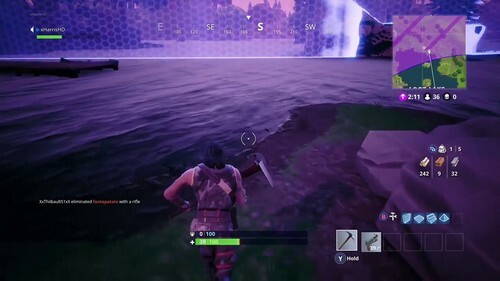 If players cannot get into safe zone in time, the storm will cause constant damage and bypass players’ Shield. 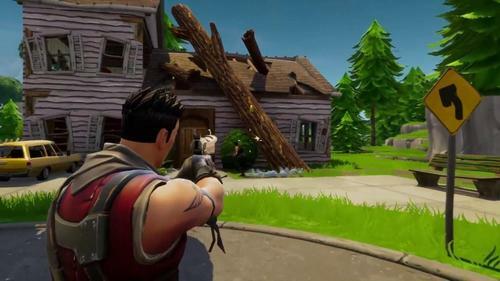 In Fortnite Battle Royale, there are 5 main weapon types: Handgun, Assault Rifle, Shotgun, SMG, Rifles, and Heavy Weapons including rocket launcher, mini-gun, or even crossbow. Other fun arsenals also included such as Pickaxe or Grenades; however, Pickaxe is a melee weapon only it is best tool for gathering materials, not ideal for combat. In addition, weapons have 5 different rarities: Common < Uncommon < Rare < Epic < Legendary/Mythic. Higher-tier weapons have more powerful damage and accuracy. Also, higher-tier weapons also include add-ons such as silencers or scopes. To put it simply: the higher the tier, the better the weapon is. 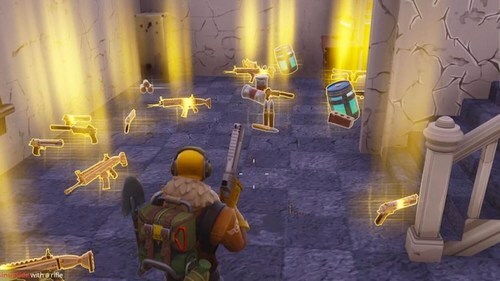 These weapons can be found from buildings, especially Treasure Chests (which we will explain in later section), and the newly added “llama piñatas”. Bandages: The most basic healing method in Fortnite. It restores 15 Health but only up to 75 points. In order to heal more than this threshold, we will need other healing items. Med Kit: This one is much rarer than Bandages due to its spectacular healing power. It heals our Health to full 100%, no matter how low our current Health is. Slurp Juice: Despite having quite a… peculiar name, this juice can heal 25 Health and especially provides 25 Shield. Shield Potion: Just like its name suggests, this potion provides 50 Shield, which is extremely useful no matter the Health and Shield condition. Mini Shield Potion: These are weaker version of Shield Potion (but still good). It gives 25 Shield, yet cannot surpass 50% Shield threshold. 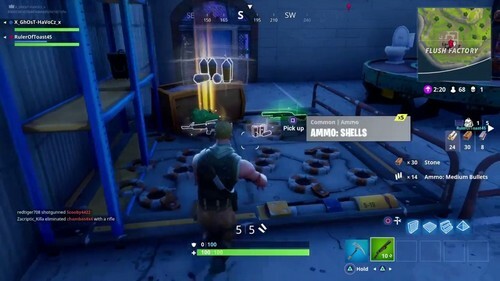 Players will need to use Shield Potion if they want their Shield max 100%. 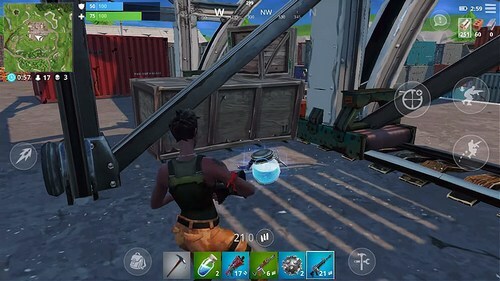 Chug Jug: This new ultimate healing item can heal players’ Health and Shield to full; but be careful though since it requires 15-sec channeling to work. Cozy Campfire: This is a healing campfire. 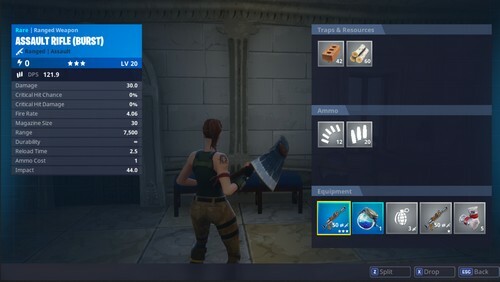 We can put it on the ground and enjoy 2 Health healing per sec, 25 sec in total which means you can heal up to 50 Health. It is best when you have a team. 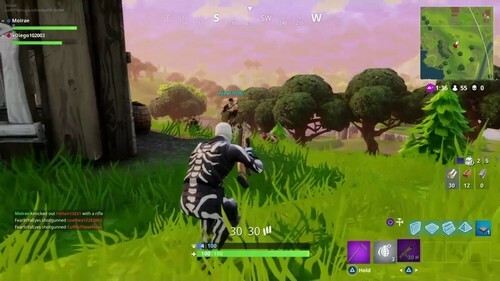 One thing to note: Health and Shield will never auto-regenerate in Fortnite. 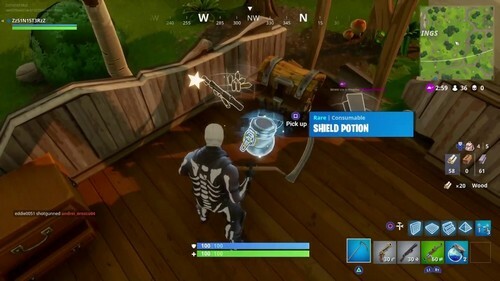 Shield will be depleted first before Health and players can only gain Shield by using Shield Potion or Slurp Juice. Spike Trap: Pretty self-explanatory, classic type of trap, yet still as effective as ever. Launch Pad: Basically this is a powerful trampoline which can launch players to the sky. Bush: This gives players a disguise like a moving bush, obviously useful for espionage tactic. Port-a-Fort: Yes you guessed it – it is a portable-fort grenade which can be thrown onto the ground and boom! A fort will appear! Honestly beginners don’t really have to know how to use those 4 support items; however, the best players will know how to ultilize these tools for their best advantage. Having ability to build is the unique element of Fortnite Battle Royale. At the start of the game, each player is already given a Pickaxe for gathering materials like Woods, Stones, or Metals. These materials are essential to build various constructions like walls. 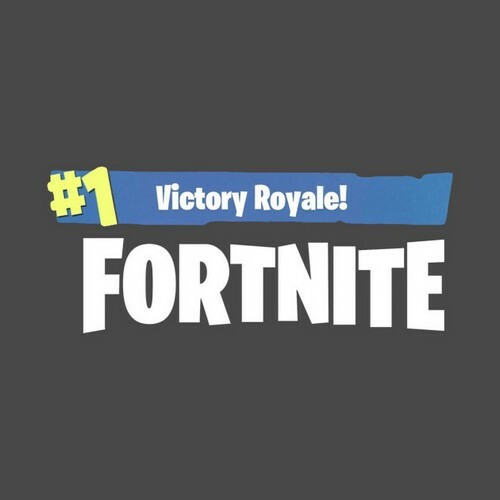 New players coming from PUBG tend to forget this gameplay element; however, mastering building in Fortnite often makes a huge different between life and death. One thing to remember though, when we build something; it will take time for the construction to finish. The tougher material is, the longer it takes to complete the construction. If you want to land as soon as possible, let you character falls as low as possible, then pops the parachute. This way you can arrive at your location of choice faster. If you see so many players jumping down while you also jump, it may be a good idea to pop the parachute early. You will land later; however, you will have to time to see where other players are landing and possibly change your landing location. Want to grab the best weapons ASAP? 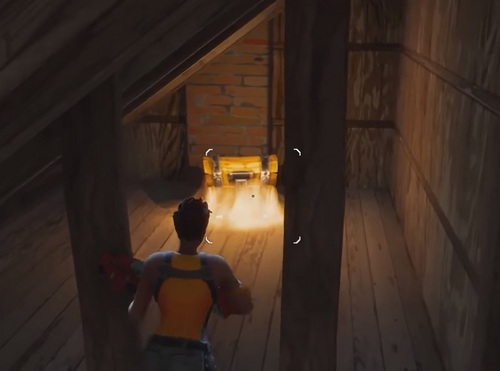 We recommend searching for Treasure Chests which are often located in the basement or attic. These sweet chests often drop about 3-4 weapons and items and you always have higher chance of getting rare stuffs. If you hear a faint angelic-choir sound while searching in a building, it means a Treasure Chest is nearby. All you have to do left is to use Pickaxe and breaks the surroundings to find it. Other interesting notion is that: all Treasure Chests have a fixed location and if you discover a chest at a particular area, you can just return to that area the next time and grab your beloved chest. It is not that hard to get more weapons and items, especially when you kill a player, he/she will drop bunch of loots. However, you will want to prioritize certain items and weapons. First off, always keep at least a healing item. Healing even a little bit can make a huge different for your future survivability. Next, always keep rare weapons like Epic or Legendary/Mythic. As we already know, these weapons are much, much more powerful than the lower rarities. And of course the better your weapons are, the better. That said, for beginner it should be wise to keep an Assault Rifle. Assault Rifle often provides decent power for both close and medium-range combat. Since the point of the game is to survive, not kill as much as possible, avoiding players and using Assault Rifle to ambush players from a distant is always a good strategy for new players. If necessary, keeping a Shotgun can also be good in case of close-combat; however, these Shotguns will not be that reliable for ambush in long-range. Finally, setting up in particular order is always a nice idea. For example, you can set up your weapons list from Handgun, Assault Rifle, Shotgun, and Heavy Weapon. By setting up the quick buttons this way, you can quickly draw the necessary weapons for different situations. And you can always spare the last slot for healing item. 2.4. Get Materials! And Build! As we mentioned above, building is an essential element in Fortnite. During the early game, many players often spend time gathering materials like Woods for future use. One of the most common uses is to build wood walls for cover. In urgent situation, building a wood wall is always the quickest way to block bullet (unless the opponent is using a RPG). Aside from making walls, we can also build ramps to access certain areas which we can’t get in otherwise. However, it is not a good idea to build a fortress because building that way is extremely noticeable and you often leave yourself in dangerous state. Then finally, you can use these gathered materials to purchase weapons from Vendor Machines. The more materials you spent, you better weapon you can get and there is no limitation on the number of weapons you can purchase. Commonly it is suggested to break walls, structures, and trees, and get at least 300 units of woods. When gathering you can see distinct blue spots which indicate the weak point, smashing that point and the structures will scramble faster. In the intense game like Fortnite, even the slightest cues such as sound can give you better advantage. The thing is: everything players do in the game can make sound, from shooting (obviously), building, to walking. By listening to the surroundings sound, you can guess if there is enemy approaching near. It may not sound that useful but it is always extremely useful to navigate your enemy and coordinate your location, ambush, or attack nicely. This also means that we should also pay attention to our own sound. Running tends to make loud noise and running makes even louder noise. Also, building and shooting obviously make huge noise and nearby players will be able to notice your location. If you want to keep as lowest profile as possible, try crouching and avoid building unnecessarily. If lucky, you may even find silencer weapons and assassinate other players in silence. Fighting in an open area is probably the last situation you don’t want to be in. Other players can easily spot you and kill you rather quickly with rifles. If possible, try to take high position so that you can have better chance scoring a headshot while other players will have hard time shooting you. 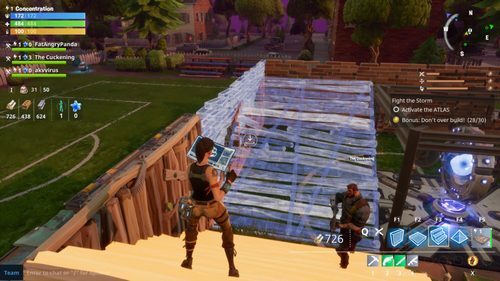 Also, try to practice quick building like walls since they can cover you extremely quickly. Certain new players may tend to focus on killing other players rather than playing stealthy. Well, that kind of aggressive play-style can be fun; however, the bad news is Fortnite Battle Royale’s goal is actually to survive until the last breath, not getting lots of kills. The whole game focuses on this point. Even if you kill 98 players, yet died by the last guy’s hand in last moment, you still lose. Of course there is nothing wrong with being aggressive if that’s your things. But for those who aims to win the match, it is highly recommended to play carefully, aware of the surroundings, and try to minimize the death-rate as low as possible. In certain occasions you may find yourself a supposedly perfect hiding spot. But in fact, there is no “perfect” hiding spot in Fortnite. Most of buildings and structures in this game can be destroyed, especially with a single RPG shot. As the results, it is always necessary to think about other escape plans. You will never know when your “safe-zone” is blown up into pieces. 2.9. Remember: Shield Potion is your Best-Friend! 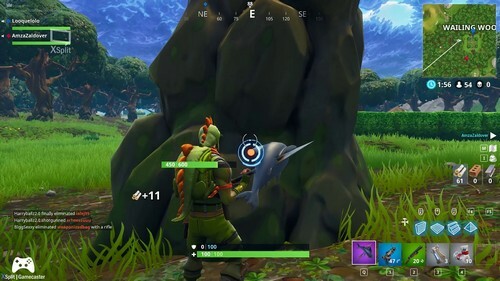 Shield always blocks you from taking damage and therefore, there is no reason not to use your Shield Potion ASAP unless you Shield is already full. Why saving your Shield Potion for future use when it can help you survive RIGHT NOW!? 2.10. Pay attention when the circle closing in! In Fortnite most players will pay attention when the circle closes in. Experienced players tend to rush to buildings within the safe circle first then wait for ambush. Therefore, if you are running for the safe-zone, pay attention to the surroundings and especially buildings. There is high chance that other player(s) already occupies the place and they’re waiting for “unwary sheep” to kill. You can also applies this strategy, just remember to make sure the building you are in is safe, then waiting for someone coming in and give him a good shot in the head. And that’s it folks! Is there any other tips we miss? Feel free to share with us and for now, thank you and stay tune for more news in the future! *Interested in Fortnite extension? Check out our Fortnite Battle Royale HD and Fortnite Battle Royale vs PUBG New Tab!